One of the greatest implements on the Internet is that of Google Maps. Not only can you get directions using it, but you can find specific addresses all over the world and in most instances, get a street view of them from your computer. It is hard to believe that just 10 years ago, this was not possible online. Using the locations noted on US Census records as well as in City Directories coupled with Google Maps, a researcher can look at the locations of their ancestors and family members exactly how they look today. This helps when one conducts a research trip and they want to map out places to visit and photograph. It also can provide family members with a tangible piece of their history that still stands or exists. Wesley Marshall, known as Uncle Suga Baby, son of Clora (Evans) Atlas, stepson of King Atlas, Jr., was a resident of Shreveport, LA. His 1930 Census record states that he and his wife Virginia live in Shreveport, District 14, Caddo Parish, LA at 1947 Poland Street. It also states that he is a machinist at a railroad shop. 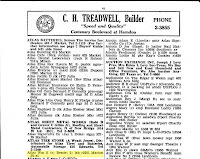 In a 1936-1937 city Directory for Shreveport, it lists that he lives at the same address, only this time, he is a machinist's helper for the Kansas City Southern Railroad. Here is what 1947 Poland Avenue in Shreveport, LA looks like today. It's safe to say that the vacant space where the steps are in front is probably the location that Wesley's house stood in. Use your mouse to turn to the right or the left or even look up, look down or zoom in. Pretty cool?!? William Steven Atlas, III and his wife Bessie lived in Shreveport, LA for a brief period of time before they moved to California. Based on a city directory from 1941-1942 they lived at in the rear of 2201 Marion Street. William was a laborer and they had 2 children in the household, probably their daughter Willie Mae and their son Chester. If we use Google Maps to plot where that location is now, we will see that it is no more and that Interstate 20 has taken it's spot.